So here I am, a mini beer connoisseur writing on Brew Bloggers! 🎉 I’m here to tell you that it’s never too late to try something new. It’s a wonderful world of brew out there. 🌎 This is my personal little guide of beers to get you started. A great man once told me that porter is the gateway beer. Truer words have never been spoken! Porters are a great way to get started. Find a microbrewery or pub that serves craft beer nearby and try a porter or two for your first beer. (Bring a fellow beer connoisseur friend for added bonus/guidance! They are always happy to help. 💁) Beer is generally a bitter beverage, so take small sips to adjust your palette. As time goes on you will get used to it. My favorite porters have vanilla flavors. You can also try stouts, but these are thicker, heavier beers that are sometimes bitter like coffee. In the summer I drink lagers which are very light, great for a hot summer day. IPAs and other ales are hoppy and I tend to shy away from those (for now) as a beginner. I also drink hard ciders (I love Angry Orchard 🍎) if I’m looking for something light and sweet. 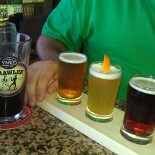 Village Idiot – This is a brewery situated in Mount Holly, NJ that has a neat little tap room. They have some of the tastiest porters I’ve come across for beginners, with flavors like peanut butter and banana bread. It’s like drinking dessert! Magnify Mind Over Matter w/ Hazelnut & Vanilla Stout – I just tried this the other day at the Chickie’s & Pete’s in Marlton, NJ. It was SO GOOD. Smooth and aromatic, you definitely taste the warm hazelnut and vanilla. Bonesaw Brewing Co. Black Friday Porter – Decided to stop by Glassboro during day trip to Down Jersey. Very tasty. Gave me a solid buzz as well! Leinenkugel’s Snowdrift Vanilla Porter – One my favorites. The hint of vanilla is just right. Cape May Honey Porter – My first honey porter. Delicious! Shout out to Old Town Pub in Bordentown, NJ! Great happy hour appetizers. Vault In The Stillness Imperial Stout – Yard House is an AWESOME location for trying beers. I tried this stout at the location in Moorestown, NJ. Yummy! Great post. BBs 4 MNBDs.. nice! You’ve come a long way! Keep me posted. This entry was posted on March 27, 2019 by Miss Maya in Beer.